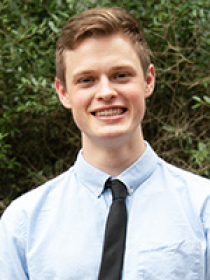 Nathan is the second environmental fellow, and as a dual citizen of the UK and USA he brings a broad understanding of environmental issues and understands the need for international solutions. He is a Religious Studies major and is intrigued by the role religion and culture play in people’s mindsets and everyday decisions. Nathan’s primary focus of as a fellow is understanding the role that religion plays in environmental stewardship. What do various religious doctrines teach about the environment? Do some religions have a more environmentally friendly disposition than others? These are just some of the questions he seeks to answer. After graduating from Stetson University, Nathan plan on continuing his education and eventually attaining a Ph.D. in some area of religious studies. 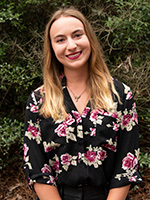 Allison Terry is Stetson’s third environmental fellow. Her passion for the natural world focuses on preserving coasts and mountains as well as the species in them. Her concern for the degradation of clean water and air by pollution inspires her work to educate others and raise awareness about current challenges to the environment. To her it is simple: these environments provide all life on earth with ecosystem services necessary for survival, so we MUST protect them. Allison is refining her skills through a major in environmental studies and a double minor in management and communication to gain a better understanding of how the environment impacts multiple aspects of our lives and how she can convey these ideas to the public. She aspires to work for and manage non-profit environmental organizations focused on sustainability and upholding everyone’s environmental rights. Matinicus Csenger joined the Environmental Fellows in Spring 2018 with the hope of engaging students who otherwise might not take an interest in sustainability and conservation. His passion for all things outdoors, namely hunting, fishing, camping, and spearfishing, came from a childhood surrounded by the natural beauty of Southwest Florida and Hawaii. Matinicus hopes to inspire others to tread off the beaten path and experience Florida’s raw beauty with his stories of hunting in the everglades, guiding thrill-seekers in Southeast Alaska, and fending off sharks with his friends through the Florida Keys. 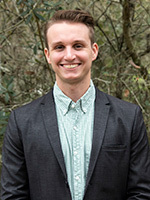 In 2019 he accepted a summer internship with the Alliance for International Reforestation, or AIR Guatemala, and ultimately plans to pursue a career in environmental mediation and green energy development. Matinicus graduates in Spring of 2020 and aims to attend law school that Fall. Gabriel is the sixth environmental fellow. He is originally from Colombia and is very passionate about technology and the Ocean. 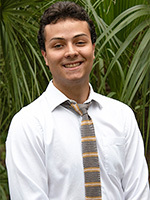 His concern for the degradation of the ocean and algal blooms in Sarasota Bay inspires him to pursue this work with the Environmental Fellows to act and raise awareness about current challenges to the environment. His primary focus as a Fellow is to engage with the community about environmental issues and help develop sustainable initiatives and outreach programs to help mitigate the environmental impact of the university. After graduating from Stetson University, Gabriel plans on continuing his education and obtaining a master's degree in Ocean technology. After that he plans on eventually becoming the Director of the program for which he interned for, the Ocean Technology Department.